Rob Sheffield's book Dreaming the Beatles: The Love Story of One Band and the Whole World is a celebration of the band, from the longtime Rolling Stone columnist. It tells the weird saga of how four lads from Liverpool became the world's biggest pop group, then broke up – yet somehow just kept getting bigger. Dreaming the Beatles, out in paperback on June 19th, follows the ballad of John, Paul, George and Ringo, from their Sixties peaks to their afterlife as a cultural obsession. In this section, Sheffield explores one of the Beatles' unheard treasures – the May 1968 Esher demos they recorded at George Harrison's pad, preparing for the White Album, not suspecting their friendship was about to turn upside down. The end of May, 1968: the Beatles meet up at Kinfauns, George Harrison's bungalow in Esher. Just back from India, gearing up to go hit Abbey Road and start their next album, the lads bang out some rough acoustic tunes into George's newfangled Ampex reel-to-reel tape deck. The result is one of their weirdest and loveliest unreleased recordings: the Esher demos. There's nothing else in their music quite like this. Most of the 27 songs ended up on the White Album, yet there's none of that record's tension and dread. At Esher, they're having fun; they don't realize all the tortures they'll inflict on each other making the White Album. Instead, it's a moment of jovial, intimate warmth – for almost the last time, you can hear they're still in love with being Beatles together. When the Beatles regrouped in England, they decided to get together and tape home demos on their own turf before stepping into Abbey Road – an innovation they'd never tried before and would never revisit. So they met at George's hippie bungalow in the Surrey countryside, decorated in the grooviest Indian style. John showed up with 15 tunes, more than Paul (7) or George (5). On the tape, you can hear them relax in an informal setting – they sit around the living room, banging guitars or tambourines or shakers, breathing in the joss stick. They recline on leather cushions – George and Patti don't have anything so square as chairs. The Esher demos are a real treasure trove; they mined it for years. Songs that got worried to death on the album are played with a fresh one-take campfire feel, just acoustic guitars and handclaps. A couple of half-finished sketches got saved for Abbey Road ("Polythene Pam," "Mean Mr. Mustard"), others for their solo records (Paul's "Junk," George's "Not Guilty" and "Circles," John's "Child of Nature," which he later rewrote as "Jealous Guy"). They whoop through each another's songs – even "Honey Pie" rocks. They sound excited to hit the studio and knock something out in a few days, like they used to, back when they had to. Nobody knows the sessions will be an endless nightmare straining to duplicate the loose feel of the demos. "Ob-Li-Di, Ob-La-Da" will go through 47 takes. "Not Guilty" will require 102 takes and not even make the album. On the tape, they sometimes speak to Mal Evans and Derek Taylor, presumably there to make tea or roll the smokes. Ringo's a quiet presence, though you can hear him bray away on "Bungalow Bill." Yet the vibe is friendly – it's like the White Album minus the hostility, which might mean it's nothing like the White Album. Some songs are still works in progress – in "Yer Blues," John is "insecure" rather than "suicidal," while George's "Piggies" eat pork chops instead of bacon. George sings the excellent "Sour Milk Sea," which he turned into a 1968 hit for his Liverpool mate Jackie Lomax, featuring Paul on bass and Ringo on drums. The lads keep trying to crack each other up, like when John does his mock doo-wop monologue in "I'm So Tired": "When I hold you in your arms, when you show each one of your charms, I wonder should I get up and go to the funny farm? No, no, no!" At the end of "Dear Prudence," John tells the story of Prudence Farrow, though the madness he's singing about is really his own. "Rishikesh, India," he says over the final guitar lick, as the others chuckle. "No one was to know that sooner or later, she was to go completely berserk under the care of Maharishi Mahesh Yogi. All the people around were very worried about the girl, because she was going insane." He takes a deep breath. "So we sang to her." 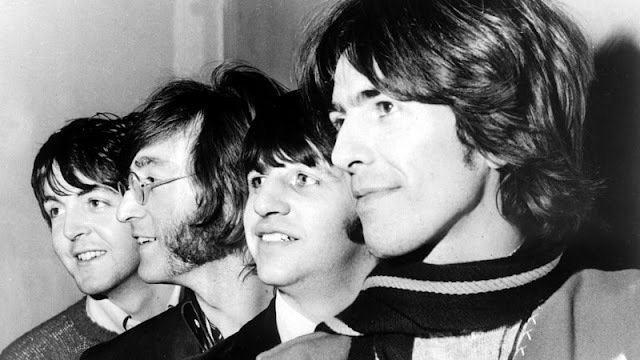 It was a berserk time for the Beatles – all their lives changed within a few days. In the middle of May, John and Paul flew to New York to announce their new Apple Corps venture. They made a disastrous May 14 visit to The Tonight Show with Hollywood diva Tallulah Bankhead, who was no fan of "I Am the Walrus." It was a major get for NBC – the first time John or Paul gave an interview on any U.S. talk show. Unfortunately, Johnny Carson was on vacation. Instead, they had to make small talk with guest host Joe Garagiola, the Cardinals catcher turned sportscaster, who knew nothing about them and blew the TV opportunity of the year. (Garagiola: "What are you gonna do when the bubble bursts?" Lennon: "I haven't a clue, you know. I'm still looking for the bubble.") The 66-year-old Bankhead did her best to spice up the banter in her famous chain-smoking rasp: "I was eight years in England and never saw a cricket game, didn't understand one word of it. So how do you expect them to understand baseball?" Their comments about the Maharishi were wasted on Garagiola – the only Yogi he ever believed in went 10 for 24 in the '55 World Series. But the really massive change happened within hours of John's return to England. He recorded Two Virgins with Yoko Ono in an all-night session where they wound up in bed for the first time, surprising poor Cynthia Lennon at breakfast and ending the marriage instantly. On May 30, the first day of the White Album sessions, the other three were stunned to see Yoko in the Abbey Road control room at John's side, where she remained permanently – even joining him on the microphone in the first day's version of "Revolution 1." From now on, they only had access to John through her. Paul, of all people, was the only one she felt gave her a proper welcome. "Paul has been very nice to me," she mused in her June 4 tape diary. "He's treating me with respect. I feel like he's my younger brother or something like that. I'm sure that if he had been a woman or something, he would have been a great friend, because there's something definitely very strong between John and Paul." The Beatles spent five agonizing months making the White Album, often splitting up to work in separate studios. The fighting got so ugly Ringo quit for a week. In many ways, the Esher demos are the last recorded moment of the Beatles as a band. For the Get Back/Let It Besessions, they tried to re-create this basement-tapes spirit, but instead documented their sad demise. Seven of the Esher songs appeared on Anthology 3 – "Happiness Is a Warm Gun," "Glass Onion," "Junk," "Honey Pie," "Piggies," "Mean Mr. Mustard" and "Polythene Pam." The rest remain unreleased. One of the most poignant moments is John's "Child of Nature," about India. ("On the road to Rishikesh / I was dreaming more or less.") Three years later, he recycled the melody for "Jealous Guy" – a love song to Yoko. But here John sings "I'm just a child of nature," in the same spirit as Paul singing "Mother Nature's Son." For these two city boys, nature was just a fantasy they shared, a family they could join to be brothers again. "Child of Nature" and "Mother Nature's Son" have virtually nothing do with nature – but much to do with each other, and the dream that everything they've broken can be healed. On the Esher demos, that bond of friendship is still holding the Beatles together. They would never sound as close again.